The Bourdoir and Bloch factory was founded around 1820 and specialised in producing fine quality porcelain in the style of the famous 18th century factories. This pair of vases were made by the Paris porcelain factory of Bourdoir and Bloch around 1890. They are made in the style of Sevres porcelain pieces from around 1770. Both vases are of bulbous ovoid form with matching twin handles and a raised rim. Each vase stands on a single raised spreading foot, and rises from an integral four footed plinth with canted corners. They stand a stunning 48cm (19″) tall and both are beautifully decorated with central hand painted panels to front and reverse. Both the panels are signed Labbe and the scenes emulate oil paintings of the French court painter Antoinne Watteau. The panels are surrounded by delicate hand painted floral sprays that extend over the whole body, the foot and the covers. The ornately moulded scrolled handles are highlighted in green & gilt and both vases embellished with profuse honey gilt highlights overall. 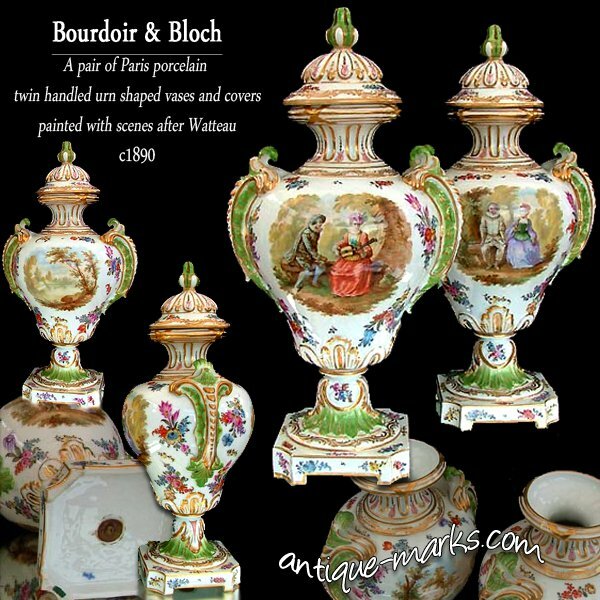 Both Bourdoir and Bloch, Paris porcelain vases bear relevant painted marks to the base. Jean-Antoine Watteau was apprenticed to a painter in his native town of Valenciennes. He eventually made his way to Paris, where he made a living by copying the works of Titian and Paolo Veronese. In Paris he joined the studio of Claude Audran III. He met Claude Gillot, a decorator of theatrical scenery, who provided the influence for Watteau’s sometimes artificial lighting and costumes. Watteau’s subjects often include figures from the commedia dell’arte which echo his observation of the theatre. Meissen groups and figures from the first half of the 18th century found their inspiration in paintings by Watteau. Jean-Antoine Watteau also invented a style of painting called the fête galante. Usually comprising large landscaped scenes of wealthy men and women in outdoor settings. This painting style became very popular and gained Watteau many repeat commissions from such artistic connoisseurs such as Pierre Crozat. Porcelain de Paris … What is Paris Porcelain? Paris Porcelain is to France what Dresden Porcelain is to Germany or Staffordshire Pottery is to England. They are all types of ceramic that bear more of a regional name for a type of pottery & porcelain than ceramics from a particular maker. There are, because of that, a great many Paris Porcelain manufacturers most of whom follow a similar style. Identifying a Paris Porcelain vase, figure or any other ceramic is virtually impossible unless the piece bears an identifiable makers mark. Normally such classification would denote an inferior product but in reality Paris porcelain is usually of superb quality. On a par with Sevres & Meissen most of the time. This pair of Bourdoir & Bloch vases fall within that category; top quality Paris porcelain that bears the makers mark.